In the US, 1 in 3 men and 1 in 2 women will personally experience cancer in their lifetime. Cancer touches everyone. By integrating specialized yoga methodology with other treatments, yoga4cancer helps to stimulate the immune system through movement, helping survivors to manage the side effects of treatment as well as dramatically increasing survival rates and decreasing recurrence rates. It also helps practitioners to decrease anxiety, regain a sense of control over the body, and find a sense of hope. Cancer takes your breath away. 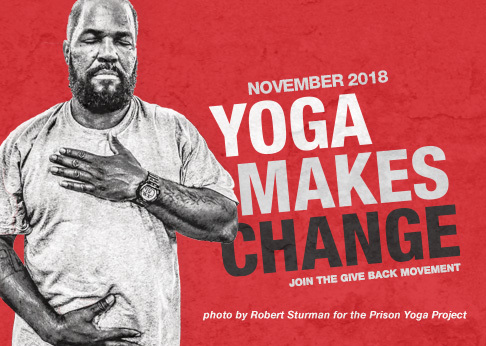 Yoga gives it back. When cancer survivors can meet in supportive environments while utilizing yoga to manage the daily challenges of cancer treatment, well-being is restored. Founder Tari Prinster created y4c in response to her personal journey with cancer and long-time history with yoga. For the past 14 years y4c has offered teacher trainings, free classes, and retreats across the US. Written by y4c founder Tari Prinster, Yoga for Cancer: A Guide to Managing Side Effects, Boosting Immunity, and Improving Recovery for Cancer Survivor shares Tari’s experience of using yoga to manage the challenges of cancer and its treatment. y4c offers community classes and workshops to help cancer patients and survivors manage treatment side effects and sustain cancer recovery. Currently there are two program formats available for y4c certification. Both have the same content and curriculum, but enable people to choose the learning format that best suits their capabilities. The yoga4cancer Online + Weekend Program offers 45 hours of online training over approximately 8 weeks, concluding in an in-person Weekend Intensive. The yoga4cancer 5-day Intensive, offered in partnership with Kripalu, provides a 45-hour certification on a compressed schedule of five days, or over two weekends. Our Goal: To share the healing practice of yoga with those who are recovering from cancer, or in treatment at any phase. With your support, we aim to bring the y4c program to more survivors nationwide, providing a tool for managing symptoms and increasing immunity.